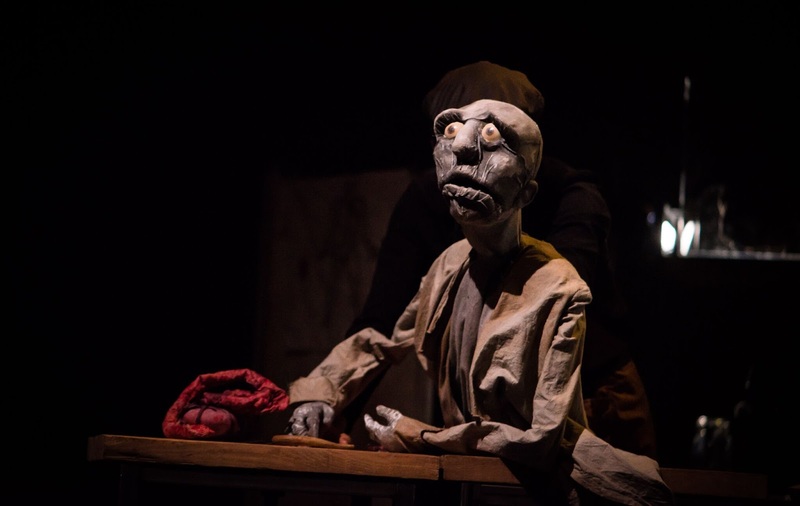 The Wilton Music Hall is a perfect setting for this atmospheric dramatisation of the life of Tarrare, a 18th century freak who suffers from an insatiable appetite for everything he can lay his hands on. The old partially renovated walls, minimalistic lighting and performers dressed as 18th century stage hands provides the backcloth to the story telling by a group of bizarre characters presented as hand puppets. 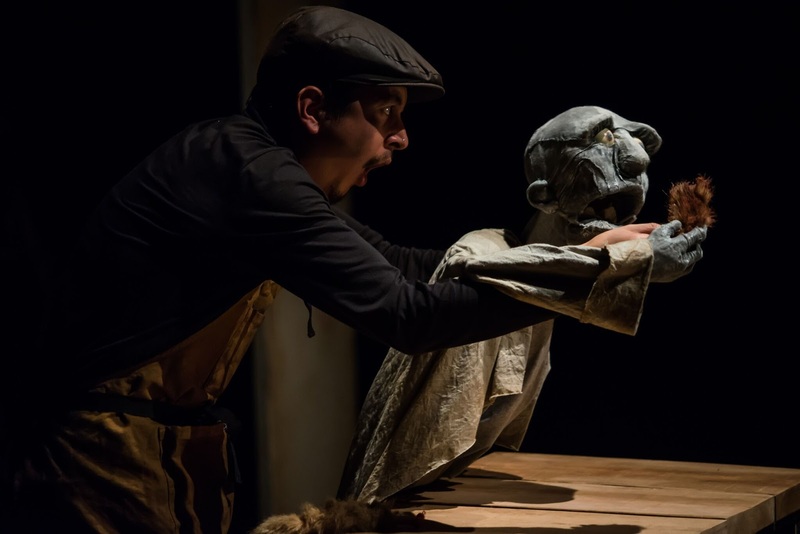 Wattle and Daub puppets are cleverly designed, simply dressed with rough skulls but in the hands of the skilled puppeteers, they engage the audience and become the sole centre of attention. Plucked from the specimen jars that set the laboratory scene, the puppets live out Tarrare life and his journey from freak show, to revolutionary spy to the clinic that tries to save his life. The original chamber music from Tom and Tobi Poster, played by An-Ting Chang and Katy Rowe that accompanies the storytelling is hauntingly beautiful and is sung with great clarity and pathos by Michael Longden and Daniel Harlock. It creates the eerie soundtrack to Tarrare’s life. At one point it transports us to the French Revolution and a scene that evokes memories of Les Miserables. 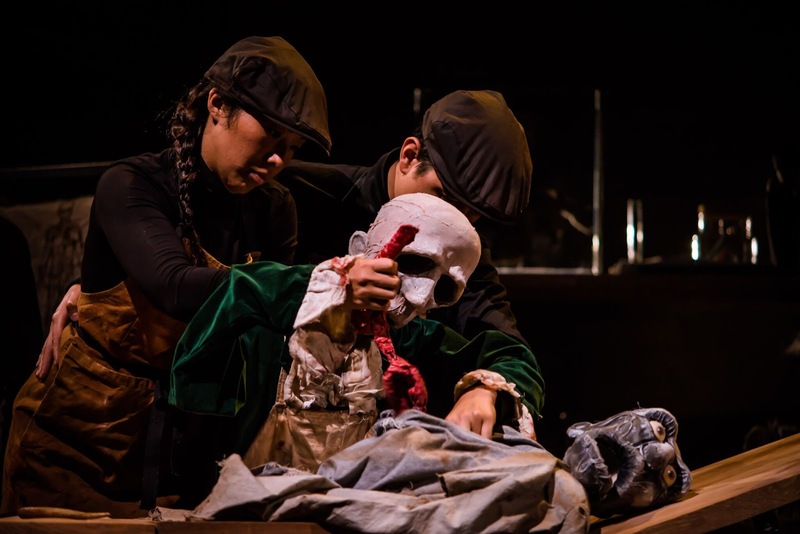 The portrayal of Tarrare autopsy, the expelling of various bodily fluids and the swallowing and regurgitation of various objects is not macabre or horrifying but witty, effective and provides the main spectacle of the show. The only faults of the show are its pace where at times the changes of the scenes are too slow, as puppets are carefully brought to life and the large cut out puppets which are far less effective than the hand held ones. 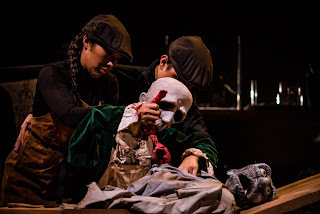 Tobi Poster and Aya Nakamura become invisible but somehow project the emotions through their puppets and leave the audience feeling for Tarrare and the other freaks who befriend him. A golden fork becomes the token of love between them. He may be described as a deprived freak but we leave seeing him as a tragic soul inflicted with an incurable habit and sadness. Musically and theatrically worth a visit.